Honda (UK) today announces the completion of its 2015 line-up with new colours for five models across the range. CBR500R - a new Millennium Red for the sports middleweight twin, which has been a key model in Honda's line-up since its introduction in 2013. The A2 licence-friendly CBR500R's combines excitement, practicality and CBR1000RR Fireblade-inspired design with low ownership and running costs. These characteristics have made it a popular proposition both for riders looking for their first full-size sports bike and for experienced riders looking for a great value alternative to larger machines. For the last two years, the CBR500R has also been used to power the PATA European Junior Cup series, the entry level class for the FIM World Superbike Championship. The European Junior Cup gives selected 14 to 19 year old racers from around the world the chance to compete in a fun and affordable competition which allows them to showcase their talent and develop the skills necessary for a career in World Championship level competition. MSX125 - a new Marigold Yellow for the popular heir to Honda's original Monkey bike of 1963. Fun and functional, the MSX125's unique style and attitude, 12 inch wheels, four-speed gearbox and high quality full-sized motorcycle parts have seen it in the top 10 best selling 125s in Europe in 2012 and 2013. SH Mode 125 - a new Pearl Celadon Green and Candy Rosy Red for the youngest member of Honda's million-selling SH family. The SH Mode 125 is big on style and ease of use, with low seat height, light weight, flat floor, 16-inch front wheel, storage room for a full-face helmet, plus CBS braking and a 50km/litre 125cc four-stroke engine incorporating Idling Stop. 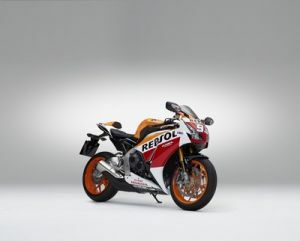 MotoGP Champions Special colours for CBR125R and CBR1000RR Fireblade and CBR1000RR Fireblade SP. Special Edition colours for VFR1200X Crosstourer and VFR1200F. New colours for the GL1800 Gold Wing and Gold Wing F6C to mark the 40th anniversary of the production of the first Gold Wing. New colours for the naked CB1000R and CB500F, and mid-sized adventure tourer CB500X.